These dreamcatcher mandalas have screen-printed images and are decorated with synthetic or chicken feathers and plastic beads. The 6" dreamcatchers weigh 0.04 lbs., and the 6.5" dreamcatchers weighs 0.08 lbs. The price below is per dreamcatcher. 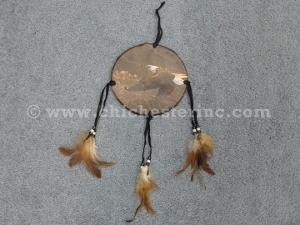 Some dreamcatchers come in multiple styles (please see pictures below), in which case, we will send you an assortment of styles. There are no export restrictions for these items. There is one style in this size. We will send you an assortment of these styles. There are 3 styles in this size.